PS The reason why we have a doctrine of infallibility is that popes are not always correct in some ways. People are very confused on this point. From the good, old CE again. to be reborn in the heart! and every day it dies! What I found the most interesting was the Holy Father's commentary on memory in prayer, having done an in depth study of that last year in the monastery and putting those thoughts on my blog. The ideal of memory in Ignatius is strong, but limited to certain types of memory, not just any. One of the very interesting things of the entire conversation is how Jesuit the Pope really is. I am actually glad to see that. But, his approach is very personalistic, almost subjective. And, of course John of the Cross moves beyond memory. As to other comments, I can say that I disagree with the Pope saying we spend too much time on abortion and homosexuality. Without us in the trenches fighting these things, the Church will be a very small remnant indeed. We have had two popes in a row with very strong philosophical and teaching backgrounds. We cannot look for that in this Pope, who tends to use experience as the formation of thought. We have just had over a quarter of a century of two philosopher-popes, who were also used to writing and teaching from a European perspective. Now, we have a pope who seems to prefer starting with his experiences in the world, rather than a philosophical framework, as he admitted, the time he was in the seminary was not particularly a good time for Scholasticism. He seems to be more eclectic in his thinking approach than were either Bl. John Paul II or Pope Emeritus Benedict. This eclecticism works for him in discussing things but also can be used against him, as definitions are not as clear in this framework. The Jesuit mindset would be more attuned to the society and the world, of course, which is what I meant about him being more Jesuit than I thought. There would be no “philosophical system” of Jesuitry, but a using of many streams of thought. To put it all down to a mystic approach would be dangerous and naive, however. This is not, dear readers, an infallible statement about anything, but a magazine article. The other thing is the South American, Spanish way of thinking which is foreign to so many of us. Cohelo and Marquez, for example… all of which I do not like, but find very post-modern and interesting from that point of view. In one of Marquez’s novels, he explores the idea of the “the solitude of power”. Maybe our Pope is trying to avoid that…. He does not seem to see we are on the edge of huge persecution. If you want some interesting information and you have about a half hour, watch this......but who is making the decisions both pro and con? Sabotage-a friend of mine lost tons in the Lehman crash...pay attention. Why is NSA monitoring SWIFT? Bernadette (last name withheld) needs urgent prayers for a serious health issue. She has a tumor in the bowel. As she is involved in the media, could we all stop and pray to Ven. 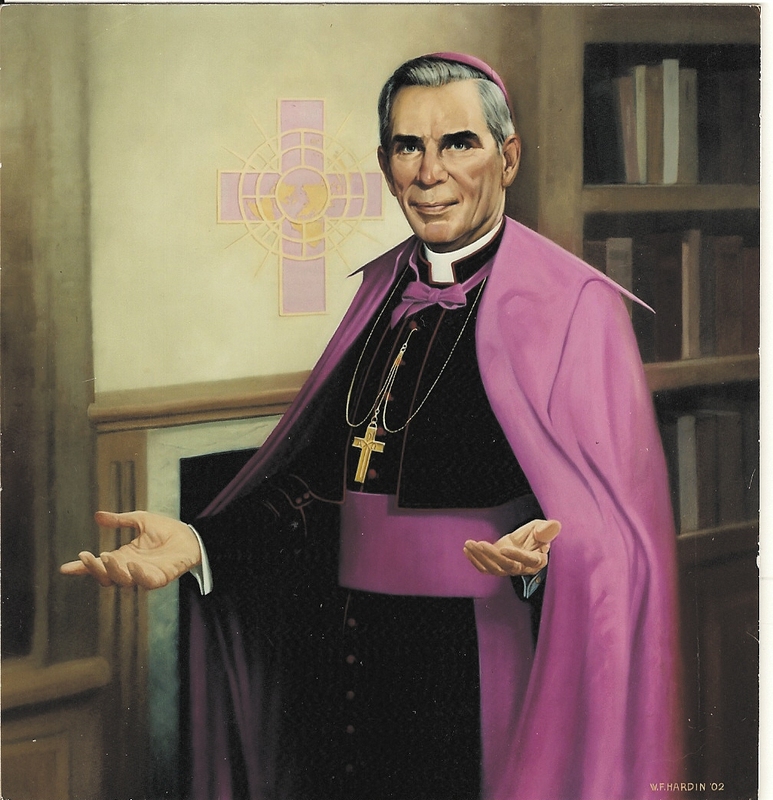 Fulton J. Sheen for her today? Let us ask for a complete healing, a removal of this miraculously. Anonymous are not published here, as on most blogs. Note that on the side of this blog. I think in this stage of blogging, most people should know that. Also, the nasty comments are usually by Anonymous. Therefore, if someone disagrees and is Anonymous, of course I cannot post this. If someone who disagrees wants a discussion, please use some sort of name and we can discuss, even in disagreement. But, I do not discuss if someone is merely ranting and raving without substance and using personal insults. Rational discourse, please. I think those who are nasty and Anonymous do not want to discuss, are not open and merely want to be nasty. So be it....And a thought, if those who are following private revelations not approved or not yet approved, and these people are nasty, what does that say about following the path to holiness through these false seers? I do not attack individuals, merely faulty thinking and flawed ideas of how to pursue holiness. Interesting....Also, I have given the opinions of bishops and other clergyman on all points, as well as applying the teachings of the great saints. All my opinions are based on studies, not merely feelings, which is why on this blog there are always sources. Many readers may not understand that in order to discuss, one must have points, not feelings. But, basing an argument on feelings is exactly part of the problem with those who follow religious experiences. Part five-predominant fault and false seers; last post on this theme-"we must not make peace with our faults"
Garrigou-Lagrange helps us on our way. The graph at the very end of this post indicates how to break the sins of the predominant fault. This is hard work. This takes time and reflection. One must be ruthless with one's self to a certain point. This is the last in this series, and more is in the perfection series. As usual, my comments are in blue. It has been said that the spiritual combat is in this case more necessary than victory, for, if we dispense ourselves from this struggle, we abandon the interior life, we no longer tend toward perfection. We must not make peace with our faults. We get use to our faults and cooperate with these. For example, if one is disobedient to the Church in matters of doctrine, one can find excuses for such rebellion, such as "My bishop is liberal and therefore, I do not need to follow his instructions on visions." Or, "My priest disagrees with Rome, so I can follow my priest." If one has a predominant fault of pride or vainglory, these type of thoughts become habitual. We always have enough grace to break through the predominant fault. As I noted in the perfection series this past year, God is calling us all to saintliness. The path is not through the seeking of spiritual cookies and cream, but through the stages outlined by the great ones, including John of the Cross, who specifically states that those who continually seek after consolations will not become holy. This is the dilemma of the experience seeker. The one who runs after apparitions and visionaries is seeking consolation instead of purification. That person does not want to suffer the Dark Night and, therefore, runs after false light-and we all know who the false angel of light is. Lastly, charity, the love of God and of souls in God, finally prevails completely over the predominant fault; it then truly occupies the first place in our soul and reigns there effectively. Mortification, which makes our principal fault disappear, delivers us and assures the predominance in our soul of our true natural qualities and of our special attraction of grace. Thus little by little, we grow to be ourselves, in the broad sense of the word, that is, to be supernaturally ourselves minus our defects. Once we are free from the prison of our predominant fault, we shall come into our own, as it were. We shall really be ourselves and finally be able to use the virtues God has given us. The gifts of the Holy Spirit will also be freed, which these are not, until we are purified. The irony is that those who seek after false visions and visionaries think they will get holiness by osmosis, just by being around those supposed holy people. How dangerous and how false, when all that one needs for perfection is one's personal relationship with God in and through the Catholic Church. We do not have to copy in a more or less servile manner another's qualities, or enter a uniform mold that is the same for all. There is a great variety in human personalities, just as no two leaves or flowers are perfectly similar. But a person's temperament must not be crushed; it must be transformed while keeping whatever is good in it. In our temperament, our character must be the imprint of the acquired and infused virtues, especially of the theological virtues. Then, instead of instinctively referring everything to self, as is the case when the predominant fault reigns, we will turn everything back to God, think almost continually of Him, and live for Him alone; at the same time we will lead to Him those with whom we come into contact. We do not need private revelations at all. We only need Christ and the teachings of the Church which give us guidance and hope. How beautiful to think we can experience a transformation in ourselves, a freeing of our personalities, temperaments--all in God. And, in the next paragraph, we are led back to St. Ignatius advice highlighted here yesterday. The saints are consistent in their roles as models for us, as they have gone before us in holiness and show us the way. Not so false seers...they take us away from ourselves and from God. That we may know ourselves better, we should vary the examination of conscience, making it at times according to the order of the commandments of God and the precepts of the Church; at other times, following the order of the moral and theological virtues; or considering the sins opposed to these different virtues, indicated in the two following outlines:from Ch22 of "The Three Ages of the Interior Life" - Fr R. Garrigou-Lagrange, O.P. Returning to this theme today, one needs perseverance to combat the predominant fault. If one is checking out the latest apparitions or seers, how does one have time to consider, to reflect, to go to regular confession? We must escape from the prison of our predominant fault. I know woman who spends inordinate amounts of money following seers and visionaries, going to conferences in various countries or even churches. They are so caught up in chasing this type of information, that they do not see the importance of a quiet, interior journey with God. Instead of staying at home and reading the teachings of the Church, this person travels extensively to find out about false apparitions. It is almost an addiction. It is a prison. Other people are making money on her greed for experiences. She could fight this chaotic lifestyle by three things, prayer, examination of conscience and a sanction. It is like an interior prison that we bear about with us wherever we go. We must earnestly aspire to deliverance. It would be a great grace for us if we were to meet a saint who would say: "This is your predominant fault and this your principal attraction of grace which you must follow generously to reach union with God." In this way Christ applied the name, "sons of thunder" (Boanerges) (6) to the young apostles James and John who wished to call down fire from heaven on a city that had refused to receive them. We read in St. Luke: "He rebuked them, saying: You know not of what spirit you are. The Son of man came not to destroy souls, but to save." (7) In the school of the Savior, the Boanerges became such gentle souls that toward the end of his life St. John the Evangelist could say only one thing: "My little children, . . . love one another." (8) When asked why he always repeated the same exhortation, he used to reply: "This is His commandment. . . . And he that keepeth His commandments, abideth in Him and He in him." John had lost nothing of his ardor, of his thirst for justice, but it had become spiritualized and was accompanied by a great gentleness. Because the predominant fault is our principal interior enemy, we must combat it. When it is conquered, temptations are no longer very dangerous, but are rather occasions of progress. The predominant fault is not conquered, however, as long as there is no true progress in piety or the interior life, as long as the soul has not attained to a true and stable fervor of will; in other words, to that promptness of the will in the service of God which is, according to St. Thomas, the essence of true devotion. (9) In this spiritual warfare, we must have recourse to three principal means: prayer, examination of conscience, and a sanction. Our prayer must be sincere: "Lord, show me the principal obstacle to my sanctification, the one that hinders me from profiting by graces and also by the exterior difficulties that would work to the good of my soul if I had greater recourse to Thee when they arise." The saints went so far as to say, as St. Louis Bertrand did: "Lord, here burn, here cut, and dry up in me all that hinders me from going to Thee, that Thou mayest spare me in eternity." Blessed Nicholas of Flue used to pray: "Lord, take from me everything that hinders me from going to Thee. Give me all that will lead me to Thee. Take me from myself and give me to Thyself." These are excellent prayers. Memorize them, if you can. And move on to the next stage, which is self-examination. What a great overlap here between St. Ignatius, mentioned yesterday on temptation, and Garrigou-Lagrange. Keep a journal, which is very Ignatian. Look at how many times you fall into that predominant fault weekly, even daily. This prayer does not dispense us from self-examination; on the contrary, it leads to it. And, as St. Ignatius says, it is especially suitable for beginners to write down each week the number of times they have yielded to their predominant fault which seeks to reign in them like a despot. It is easier to laugh fruitlessly at this method than to apply it fruitfully. If we keep track of the money we spend and receive, it is still more useful to know what we lose and what we gain from the spiritual point of view for eternity. Do we budget? Do we keep track of the money we need to spend? The same type of vigilance is necessary. It is also highly proper to impose a sanction, or penance, on ourselves each time we fall into this defect. This penance may take the form of a prayer, a moment of silence, an exterior or an interior mortification. It makes reparation for the fault and satisfaction for the penalty due it. At the same time we acquire more circumspection for the future. Thus many persons have cured themselves of the habit of cursing by imposing on themselves the obligation of giving an alms in reparation each time they fail. If your predominant fault is greed, take less food. If it is sloth, get up earlier in the morning and pray more. One more post on this theme later today and enjoy the news article on the Great Escape.